If you have upgraded to Beta 1 of the new OS and you use OneDrive, you might stumble across an issue I did. I was unable to sign in. 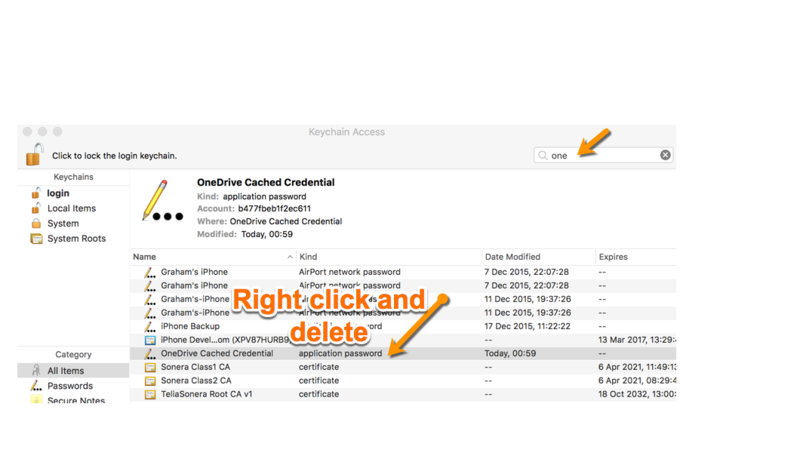 Turns out I needed to remove the OneDrive cached credential from the Mac Key Chain Access. Just open up Keychain Access (Mac Key+Space) and type in Keychain and open the app. Then search for one in the top right corner and right click on the OneDrive line and delete. Then re-open your OneDrive client and sign in it, all should be good. Click “Reset my Default Keychain”, and follow what it asks you to do to confirm. Reboot and then try iCloud again. However, I did not need to reboot.